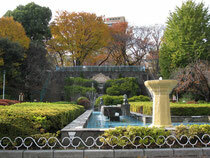 Exit.4b →There is a park Isokawa in front of the station. Across the park. There is a statue of Kasugano. Walk up a little bit. There is a crossing. Cross to the opposite side. Walk through the street in front. 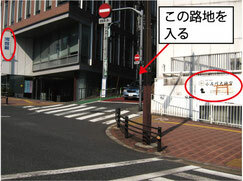 The second building to your right is the Sasaki Bld. You will see white lanterns soon. ( see pictures) This is the building of our office. 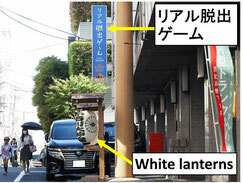 Please pass these lantern and get into the building. On the 4th floor Room No.405 is the TJT Studio.